If you live here in Richmond or you can get to Richmond for Folk Fest http://www.richmondfolkfestival.org/docs/event_schedule.html you will be treated to three performances by Samba Mapangala and Orchestra Virunga. 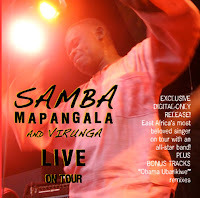 Samba Mapangala was born in Matadi, Congo and began his musical career in Kinshasa. On tour in the eastern part of the country in the mid-70s, Samba and others from the group Orchestre Saka Saka left to begin work in Uganda as Les Kinois or, roughly, "The Kinshasa Guys". In 1977, they moved to Nairobi, Kenya and in 1981 started Orchestra Virunga. 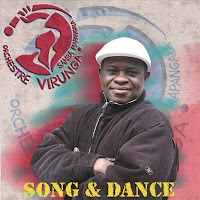 It was at that time that Samba and his band recorded the album that has gained and kept international attention, IT'S DISCO TIME WITH SAMBA MAPANGALA & ORCH VIRUNGA (aka MALAKO DISCO). 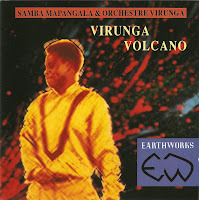 This set of songs was reissued on the Earthworks label as VIRUNGA VOLCANO, an album listed as one of the 100 "must-have world music releases" of all time. 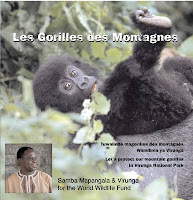 We start the program today with a track from Samba Mapangala and Virunga's new LIVE ON TOUR release, a song by Les Kinois and one from MALAKO. After that, we talk a bit with Samba on the phone and we are honored to be able to premiere a new song of his. The second hour of the program features more songs from Congolese musicians and groups who made their mark in Kenya - Baba Gaston, Les Noirs, Les Mangelepa, Orchestra Viva Makale, Super Mazembe and more. Here are a few of the album covers from today's program. Fantastic program. A special thanks for playing 'Ka Chonjo.' Apurva from Pune, India.